We checked out of our hotel this morning and decided to drive around the southeast tip of the island. In the past, this road was washed out and not paved in a few sections. Rental cars strongly discouraged tourists from taking it. This year, the road had been improved and we convinced Mom it was okay to take the route if we went slowly. It was definitely a beautiful journey around the coast. In some places, it reminded me of Big Sur south of the Monterey Peninsula in California with its rocky coastline and dramatic blue Pacific views. We stopped at Mokuia Point, where some people we jumping off a rock formation into the Pacific for a swim, though the currents looked pretty dangerous. The view was awesome, as we could see the Big Island in the distance. We stopped at the, an organic farm, with food stand. Inside, a young lady who owned the farm made amazing smoothies. 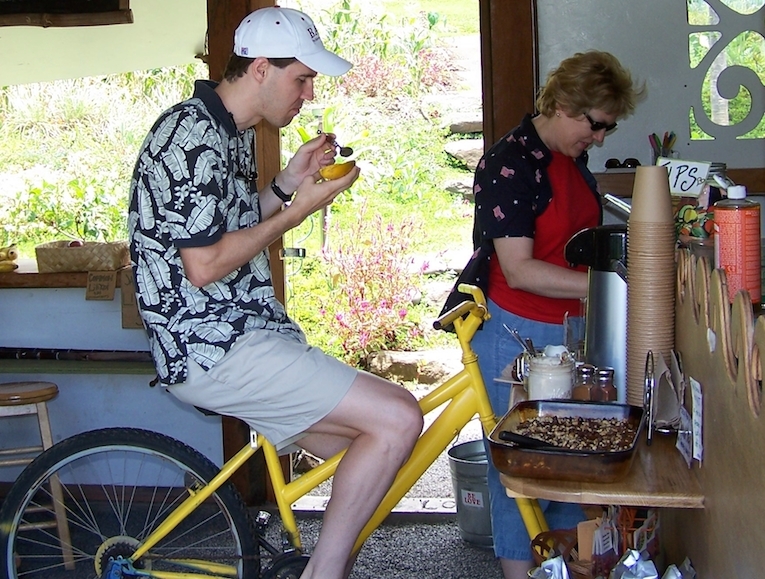 The catch – you had to ride bike that powered the smoothie grinder. What a green operation! After successfully rounding Highway 31, we arrived back in Lahaina on the northwest coast that evening. We checked into a condo at the ResortQuest Papakea. The condo was really awesome and had amazing views of the pool and beach. The owners were from Minneapolis, and we enjoyed reading through their guest book before writing our own entry. That evening we went to dinner at Dukes, one of our favorite Hawaiian restaurants that we have visited a number of times in Hawaii and California. We had some pecan-crusted mahi mahi which was amazing. On our way home, we stopped at a Safeway to buy some groceries for lunch and breakfast during the week. It’s a great way to save money instead of eating out every meal, which is expensive in Hawaii!